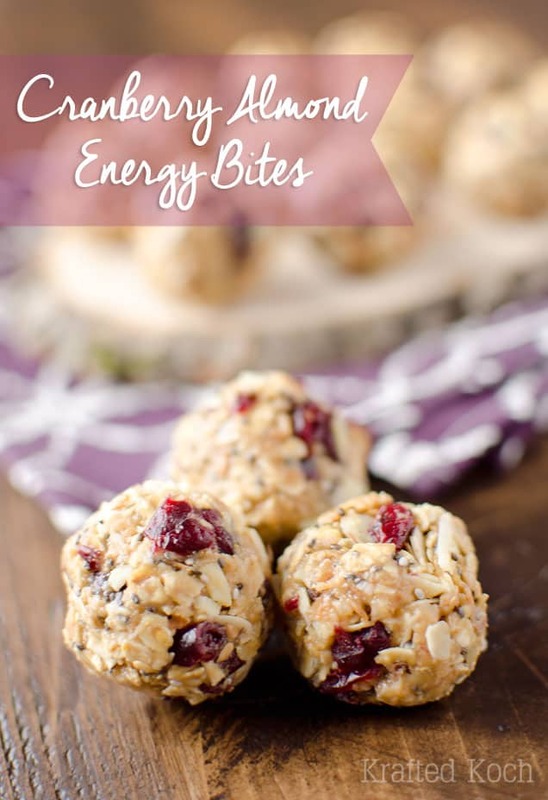 Cranberry Almond Energy Bites are a protein packed recipe that you can store in your freezer for a healthy and convenient snack or breakfast. Loaded with nutritional foods like chia seeds, ground flaxseed, peanut butter and almonds, they have plenty of protein, fiber and healthy fats to fill you up and give you the energy you need to conquer your day! These are wonderful, they were super easy to make, delicious, and very filling too, THANKS!!! These are ridiculously filling and gave me lots of energy, too. I’ve been taking 2 with me everyday; eating 1 before my workout and one after. They work wonders! Thank you so much!! So glad you enjoyed them Sarah! 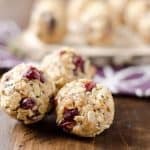 I am unable to find the Recipe for the Cranberry almond bites, can you email it to me. You could certainly press these into a 8×8 pan and just cut them into small squares. Make sure it is thick and the bars are cut small because they won’t hold up as a thin bar. I was having a hard time shaping these into balls- how long do you generally wait for the mixture to cool? My mixture wasn’t cold, but I gave it a good 45 minutes to cool. Either that or maybe I need more nut butter? The ingredients together taste great! Hi Ricki, it helps if you microwave the nut butter so it has more coverage. You can always add more nut butter, but this will increase the calories and fat. Delicious! Perfect for a pick-me-up snack between meals. Even my picky eater 3 yr old twins like them! Thanks Kim, glad you and your kids enjoyed them! what would be a good replacement for the coconut, don’t care for it? Hey Cyndi, you can just leave out the coconut and add a little extra honey or more cranberries to balance the sweetness you would have gotten from the coconut. What about the oatmeal? What do you suggest subbing for that? I have a kid allergic to it. We were looking good up until then. I haven’t tried any substitutes for the oatmeal myself, but perhaps quinoa flakes would be a good alternative? Cyndi – I substitute raw, unsweetened coconut in most recipes. All the health benefits of coconut without the sugar – and as an added bonus for you – minimal coconut flavor. Cheers! Is there anything I could sub for the honey? I can’t do sugar, but can do sugar free syrups, etc. Do you think something else would work? I am not very familiar with sugar free syrups, but you could just substitute additional peanut butter for the honey and add a bit of Truvia or other artificial sweetener if you feel it needs a little more sweetness. Please be sure to swing back and let us know what works for you! Agave nectar is lower on the glycerin index and takes less for sweetness. You might try that. Thanks for the info! I used almond and cashew butter instead of honey and they turned out perfectly! I’m happy they ended up turning out! Is it a cup of cooked oatmeal or dry oatmeal? Do you use old fashioned or instant oatmeal? I have used both in this recipe but I prefer the instant oats personally. Delicious !! however I recommend to use unsweetened coconut unless you have a sweet tooth ! In New Zealand a Coeliac cannot eat oats. Do you have any suggestions for a GF substitute for those. From what I understand they make some oats that are guaranteed gluten-free. These are delicious! I’ve tried them with natural peanut butter and with regular peanut butter, and while the latter nukes better and is easier to mix in with the other ingredients and shape the balls, it is saltier. what type of oats do you use? I just bought steel cut oats to have for breakfast cereal, which are different from the rolled oats. Would it work or would i need to do something different? thanks . I do have both types of oats, so I can do it either way. Steel cut oats should work just fine. Quick oats are really the only thing you would want to avoid. Why avoid quick oats? That’s what I just bought. I know you said your prefer ‘instant oats: you mean the ones in the packets? Quick oats are going to give you a different texture seeing they are ground up. You can use them, you will just get a different texture. These are wonderful! I added 1/3 cup semi-sweet chocolate chips. Yummy!!! Oooo, that sounds like a wonderful addition, I will have to try that! Do you have to use instant oatmeal? Or can I use plain rolled oats instead? Rolled oats are perfect, I actually wouldn’t recommend using the instant oatmeal. Will these go bad if they are not refrigerated during the day? Looking for a day time snack for my kiddo while he is at school. You can absolutely keep them at room temp for a few days. Keeping them refrigerated just keeps them fresh longer. They are perfect for a day time snack! What is the difference between quick oats and instant oats. I haven’t tried it yet, but have actually thought of doing the same thing. My guess is you would have to add more protein powder for binding because the powder will dry it out a bit. I’ve done it with a slightly different concept here and it worked wonderfully, https://www.thecreativebite.com/protein-peanut-butter-truffles/. What did you bake the oatmeal, almonds, and coconut in? What benefit does cooking the oats, almonds and coconut add? The other energy bites I’ve made don’t require baking and they turn out just fine. I love the idea of the flavor combo. It toasts all of those ingredients to bring out a deeper nutty flavor. You can skip the step, but it does add better flavor. Tried them and love them. I was thinking these were like the peanut butter protein bites and I totally didn’t read the directions. So I didn’t toast anything. 😖 not sure how that will affect the taste. I guess I’ll find out. I usually make the coconut-chocolate version of this recipe, but I’m so glad I switched it up! These were amazing. My kids and I really like these, but there’s no WAY with six in our fam that I can roll all those little balls. I’ve made these five or six times and just press them into a 9×9 pan, chill, slice, and go.